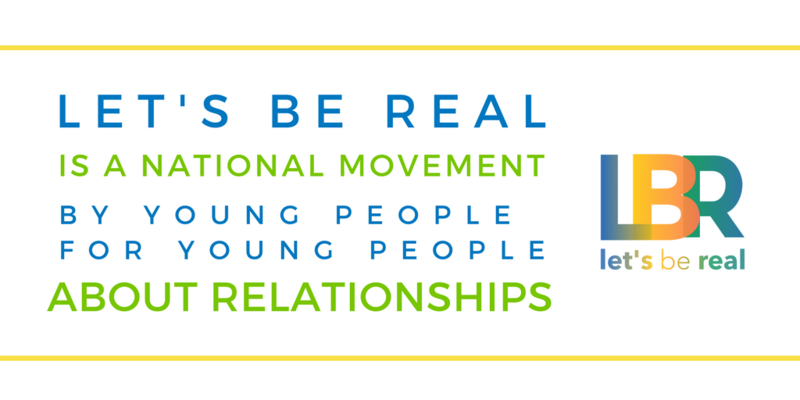 Break the Cycle believes every young person has the right to a safe and healthy relationship, but not every state defines dating violence or dating abuse in the same way. As a result, not every state gives young people in dating relationships the same protections from abuse. Read below to learn your rights and download our advocacy toolkit written by and for young people to fight for your rights. You have the right to be free from all forms of abuse in your relationships. In many states, abuse is a crime. Also, many states give the victim the right to file a case in court to stop abuse from a romantic partner or an ex-partner. However, you do not have to contact the police or go to court to get help. 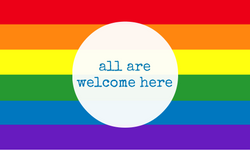 You also have the right to get protection from your school under a country-wide law called Title IX (Title 9). For more information, visit Know Your IX, and check on your college's current Title IX status here. What are my rights if I am under 18? The law will vary depending on your state. Some states allow minors to get legal help without any parental involvement; others require parents to be involved right away. In other states the laws are unclear, leaving it up to judges to contact a minors' parents if they think it is in the minors' best interest. Protection orders are a powerful tool that can help you safely leave an abusive relationship. 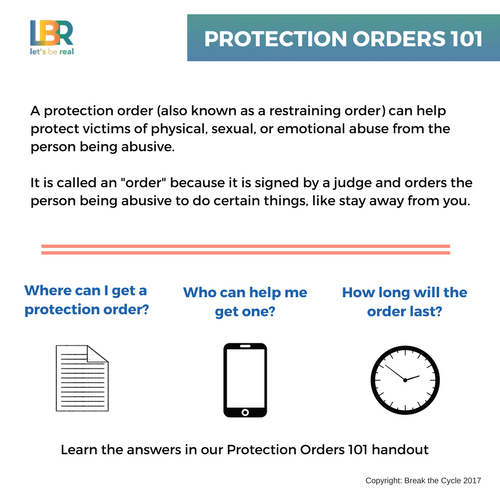 A protection order (sometimes called a restraining order) is a court order restricting an abuser’s movements and activities in relation to the victim. The law is different in every state regarding who can get a protection order and what the order can say. But generally, a protection order will protect the victim from having to come into contact with the abuser by prohibiting the abuser from stalking, harassing, communicating, or coming anywhere near the victim. If the abuser violates the order, they can face criminal penalties including jail time. Read the Protection Orders 101 handout to learn about domestic violence protection orders. Minors (people under the age of 18) may need additional information and special considerations included in their protection orders. 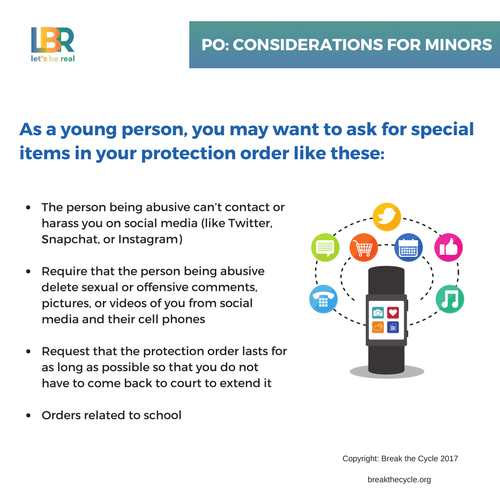 Read the Protection Orders: Special Considerations for Minors handout to learn more. A lawyer or legal advocate is a trained legal professional who can discuss all of your legal options with you, help you create a safety plan, and connect you to the civil or criminal justice system. In many cases, a lawyer or legal advocate can help you obtain a protection order against an abuser and help ensure that the order is followed at your home, school, or place of work. Every state has laws that require certain people to report suspected child abuse to government authorities; in some states, dating abuse is treated in the same way as child abuse. Contact Break the Cycle if you have questions about the law in your state. If you are between the ages of 12-24 and live in the Washington, DC metro area, lawyers at Break the Cycle are ready to help you and our services are free. Please call us at 202-849-6289. If you live somewhere else in the U.S., call the National Domestic Violence Hotline at 1-800-799-7233 for help finding a free lawyer in your area, click here and choose your state to find a lawyer. If you or someone you know is experiencing abuse, you can text 'loveis' to 22522 to talk with a peer advocate.